The pins are headed for some serious damage! Inducted onto our popular "BuzzBOMB" line of high performance bowling balls. 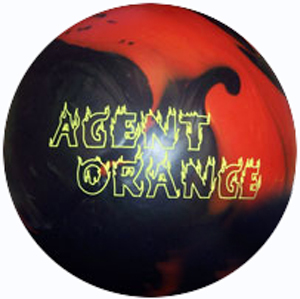 The Agent Orange bring you ball reaction where you had none before. The 500 grit Pure Grip pearl coverstock, molded around our patented Doomsday Bomb2 weight block turns the LANES into FLAMES as it burns through the heaviest oil. What are you waiting for? Put the heat in your hands, and watch your ball BURN up the lane with ball reaction, and extreme power at the pins on heavy oil..!! # Available Weights: 12, 13, 14, 15, & 16 lbs. This is a repost of my original review in the Lane 1 forum with an added update. I knew the 500 grit Abralon finish would be WAYYYYY too much so I stepped it up to 4000 grit without polish. 1. This ball looks way cool going down the lane!!!! The charcoal grey/ orange flipping going down the lane is just an awesome sight. 2. The ball ignores the heads, reads the middle well and has a HUGE backend reaction. 3. Pin carry is way above average...far better than the BuzzBomb/R in my opinion. 4. This ball recovers from ANYWHERE!!! I threw a few balls that stood NO CHANCE of getting to the pocket much less striking...BUT the ball got there and eventhough they didn't strike they left easily convertible spares. The ball is significantly stronger than the Evolution, Teal THS, SuperNova, SuperNova XP, BuzzBomb/R, or original G Force. Total hook for the Agent Orange is just a tad less than the original BuzzBomb (at 2000 grit) BUT the coverstock and layout get the ball to read later which gives the illusion thatthe ball is actually hooking MORE. My Pin over ring BuzzBomb will start to pick up around 38 feet while the Agent Orange waits until around 40 feet. On edit....I tried using the 4000 grit finish on league night and found it a bit twitchy so I dropped it back to 2000 grit with an ever so light kiss of Secret Sauce. This is the ticket. The 4000 grit was just too smooth to read the midlane like I wanted on a fresh shot. This is just a fantastic addition to Lane 1's line up. Want a good 3 ball strike ball arsenal? Chainsaw, Teal THS and Agent Orange or BuzzBomb (depending on if you prefer solids or pearls) will cover almost anything you run across. I was the lucky winner of the free lane1 ball of your choice contest put on by Lane1, and Bean's right here on Ballreviews. My choice was the newly released Agent Orange. After consulting with Richie at Lane1 I decided on a 4 1/4" x 3 3/8" drilling. The ball arrived @ 15.2lb. 31/2oz. top and 3.25" pin. I took the ball to my drillers, Otis Pillow pro shop, and had Otis lay it out as suggested ( which is exactly how he would have laid it out for me anyway, see he and his son Billy both throw Lane1 themselves) which ended up pin 1/2" up or so from the ring @ about 1:30 position and the cg kicked out, and a modest xhole on my val, the ball ended with 1/2oz pos. side,1/2oz finger, and 3/4 top. I immediately took it out to the lanes with my other Lane1 balls (Buzzbomb,Buzzbomb/R, THS) to give it a test run and all I can say is WOW!. This ball is a beast, it easily outhooks the BBR and THS and probably the BB also, but the shape of the shot is so different it might be deceiving, the AO gets through the heads much easier than the BB and almost as good as my polished higher pinned BBR, has a good midlane read, and a very, very powerful turn to the pocket, I would say almost angular in its move. The recovery is just silly good, which is a real plus for my higher speed stroker style, I was throwing lines I have never been able to pull off before! ( right toe on 37 ball crossing 17 at the arrows, breaking at 8-10 board!!) Next two trips out in league I was able to use the AO all three games and posted a 672, and 728 at a house I have struggled at the entire season so far. I could finally keep my speed up in my comfort zone approx. 17.5mph and stay more up behind the ball and play a line 13-15 at the arrows 5-8 at the break point and just lace the pocket all 6 games, with only very small moves in needed. I would say if you are a stroker like me this ball is a definite MUST HAVE!, and I would like to thank the wonderful people at Lane1 for this true gem of a gift!! Lane1 BABY! F.O.S. Man this ball rocks!!!!!! I am a tweener, put my right foot on the middle dot and throw at the 7-8 board and this ball rips its way back. Hits real hard, lots of pin action. I was skeptical at first being i havent bowled since hammers were red and black and rhino's were in. First game with this 191 and second 251. I was very amazed with this ball and cant wait until the dynamo comes out cause im definatly getting one. Lane 1 hit a homer with this one. My first Lane 1 ball. I through fast, down and in some would say. Had a very hard time with heavy oil and could not bust 190s in the first game. Saw the review of this ball in the US Bowling Magazine, the one the USBC sends out. For the first time in my bowling carrie someone wrote," a ball for faster speed bowlers". I bought it, It really worked!!!! had to order it on lineno shop in the Dayton Ohio ara carried it. I was so tired of spending big money on what the pro shop guy says "buys this ball it would out hook anything u got" A $1000 later, I finally found a ball that will turn while doing a 100mph on oil. I don't know much about the company, but for the last four months 198-210 on my first game (in the PBA experience league and a few tournaments)is all I need. First off the ball I have I got from saw head in a trade/purchace. The ball came in with a 2-3 inch pin and the ball is stacked leverage. OOB condition this ball is a beast. It gets threw the front part of the lane but once it hits the midlane this ball turns over with the most aggressive arc i have every seen it turns over left and just keeps coming. The only problem i have with this ball is I cant keep it to the right side of the headpin. I was thinking about polishing the ball and tame it down but I would rather keep it in the tourney bag for that flood I sometimes see first game. Over all this a a great heavy oil ball will be nice to have to get a little angle on heavy oil. Thanks for reading and my specs are in my profile. Page created in 0.699 seconds with 22 queries.